With millions of devices already sold, the iPad 2 merely reinforced Apple's position as the leader of the tablet market. While Apple is busy selling the latest iPhone 4S, Amazon is having a tough time keeping up with the insane demands for its upcoming tablet called Kindle Fire. Touted as the iPad-killer, Amazon's Kindle Fire comes packed with almost the same amount of features as the iPad 2 but at an unbeatable price of $199. 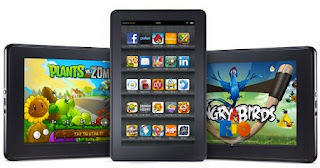 Many experts have predicted that once it is out, Kindle Fire might do to iPad what the Android did to the iPhone. Here's why we, at Tech Source, believe that this Amazon's latest offering might make a huge dent in the tablet market by surpassing the dominant iPad 2. Prices for iPad 2 start at $499. At $499, what you get is a Wi-Fi-enabled iPad 2 with two cameras. Amazon's Kindle Fire on the other hand, comes at an incredibly low price of $199, which itself, is its biggest selling point. I know, many people argue that the Kindle fire doesn't have camera or 3G, but folks, do we really need a camera on a tablet? People look ridiculous when they take pictures with their iPads. A tablet device is all about the content. You can make a cheap $200 Android tablet and sell it to say 10,000 people. But when you have to sell it to millions, the content becomes the prerogative. The iPad sold millions of devices because it managed to bring engaging content directly into the consumers' hands. In order to outmatch content like that, any competitor needs to have a huge repertoire of quality content. And, Amazon currently has more quality content than Apple. 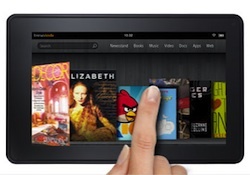 The Kindle Fire offers unlimited streaming of movies and music to its Prime customers. They've also announced high quality Whispersync-enabled magazines for the device, making it even more lucrative to the consumers. Furthermore, with millions of books to choose from, Kindle Fire also doubles up as a great reading device. The Kindle Fire's price tag may be cheap, but that is no way reflected in the performance and build-quality of the device. The 7-inch tablet comes with a 1GHz dual-core processor, 512 MB RAM, and 8 GB of internal storage. The device has a solid Gorilla glass coating and it weighs only 14.6 ounces. The iPad 2 on the other hand, weighs 21.28 ounces, and has a 1GHz dual-core A5 processor. The specs in both the devices are almost the same; however, the price differs by as much as $300. Apple has millions of apps in its App store but Kindle Fire, as of now, suffers from a dearth of quality apps. That may change however, as once the device is released, many app developers will definitely come up with some quality apps. Remember that Android too came in late, but now it has taken over Apple in the number of apps downloaded. The Kindle Fire features a super fast web browser called Silk that crunches web pages using the cloud. The result is that pages load way faster than they would usually load on a normal browser like Safari or Chrome. Here too, Kindle Fire wins the round, because, after all, who doesn't love speed? The Kindle Fire is the first tablet device that is completely cloud ready. If, at all, you run out of the 8GB space on your device, don't worry, you can store as much data as you want right into Amazon's cloud servers. Currently Amazon has no data caps or charges for this service. Finally, Kindle Fire comes with the amazing Whispersync technology that syncs your data across all the devices you own. Imagine you are watching a TV show on your Kindle Fire and the battery runs out. You can then resume watching the show right where you left off from your computer using Amazon's streaming services. Apple's yet to come out with a match for this little marvel. Of course Amazon would also need to sell it outside the US for it to be global hit. @Anonymous I know the iPad is hard to beat that is why I said 'might' on the title. I also own an iPad 2, and while using it for several months now I realized that I needed a smaller and lighter tablet. So, in my own opinion, the Kindle Fire is without doubt the best iPad-replacement at the moment because of its affordable price, good hardware capabilities, and tons of handy features and services. I think what Android did to the iPhone was show how good the iPhone was. The vast majority of Android phones had such short life spans before they were replaced and updates were never guaranteed. I had a HTC Desire which isn't even 2 years old yet and thats been left running a year and a half old operating system whereas the iPhone 3GS which is over 2 years old is still being updated. Android gained market share by undercutting the price of the iPhone (at the cost of quality) and by flooding the market. That will always happen when you have a platform which many manufacturers use compared to one a single company uses. I'm looking at the Nook Tablet. It has 16gb internal storage, and has a micro sd slot that accepts 32gb cards. It also supports more document types, and has longer battery life. The downside is it costs $50 more than the Kindle Fire. That's the best insight about this article, yet! My sentiments exactly, now that you put them into words.